It's supposed to snow here today.....brrrrrrrr.....as far as I am concerned, any day is too early for snow. I am not a fan of snow, but I am a fan of a warm bowl of hearty soup on a cold day! I made this Lentil and Sausage Soup yesterday, which has been adapted from a recipe that is currently one of WW online featured recipes. Since I was busy making multigrain bread yesterday, I thought a good soup to go with it for dinner that I basically just needed to dump the ingredients in, turn on the crockpot and forget it was in order. 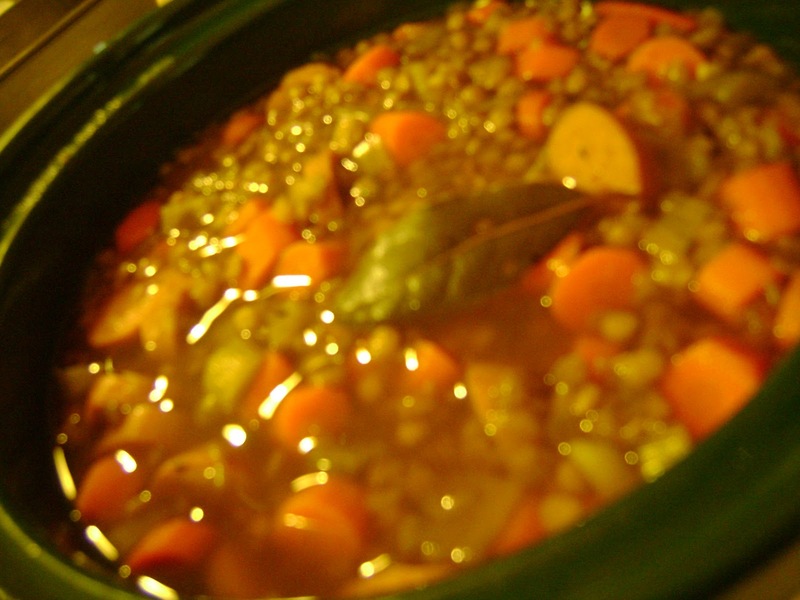 I have never made lentil soup before, but I have had it in a Mediterranean restaurant we like to eat at now and then. Lentils are so easy to make...and there is no overnight soaking required with this recipe. 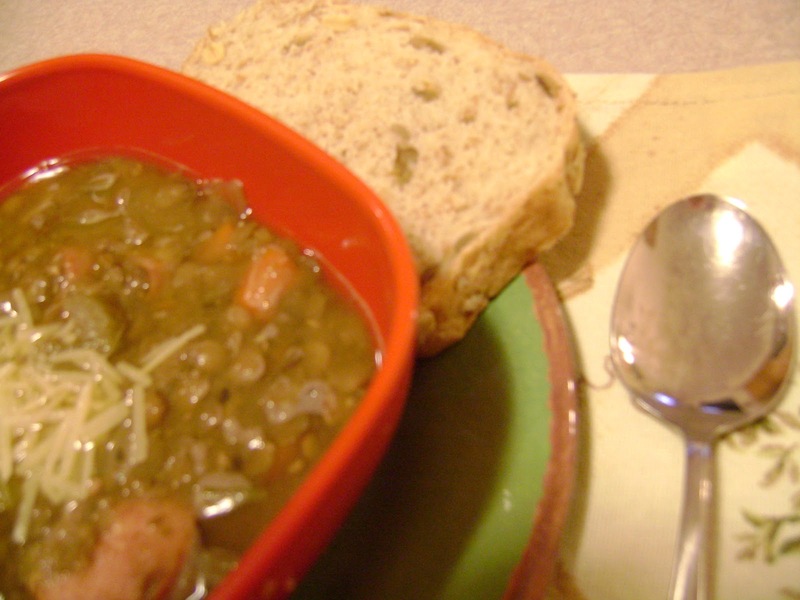 Lentils are a great vegetable source of protein, dietary fiber, folate, vitamin B1 and iron. This recipe serves 10 at 5 points+ per serving. The original recipe called for adding Canadian bacon, but since I didn't have any, I substituted turkey smoked sausage, and it was delicious. I garnished it with some Parmesan cheese, but feta would be great too! Place ingredients in a 4-5 quart slow cooker in the following order; carrots, celery, onion, garlic, lentils, bay leaves, thyme, salt, pepper and broth. Cover slow cooker; cook on low for 6 hours. Uncover, stir in sliced sausage and heat for 30 minutes more. Remove bay leaves. If you like it creamy ( and I do) you can remove about a cup of lentils and broth and give it a whiz in the food processor then return it to the pot, or do like I did, and put your immersion blender in for a few minutes to puree up some of the lentils. But this step is completely optional. Each serving is about one cup with a 5 point+ per serving value. I'm definitely going to make this one! I made this soup this weekend and just now had a bowl. Yummmm! I made just 1/2 the recipe and I browned the turkey sausage before adding it to the slow cooker. Super easy and supuer DELICIOUS! Thank you for sharing! This soup is so wonderful I already made it again. If froze and reheated beautifully. Hi! This recipe looks wonderful, and I'm going to try it this weekend. About how large would you say is the serving size for 5 points? A cup? probably somewhere around 1-1/2 to 2 cups. It fills up the crockpot I have, and it's a 6 quart, so there are 4 cups in a quart = 24 cups in 6 quarts. 10 servings would be somewhere around 2 cups. It's a good soup, pictures don't do it justice. Hope you enjoy it!